This year marked a quarter of a century since Doug and Mary had moved into their North St. Paul home. 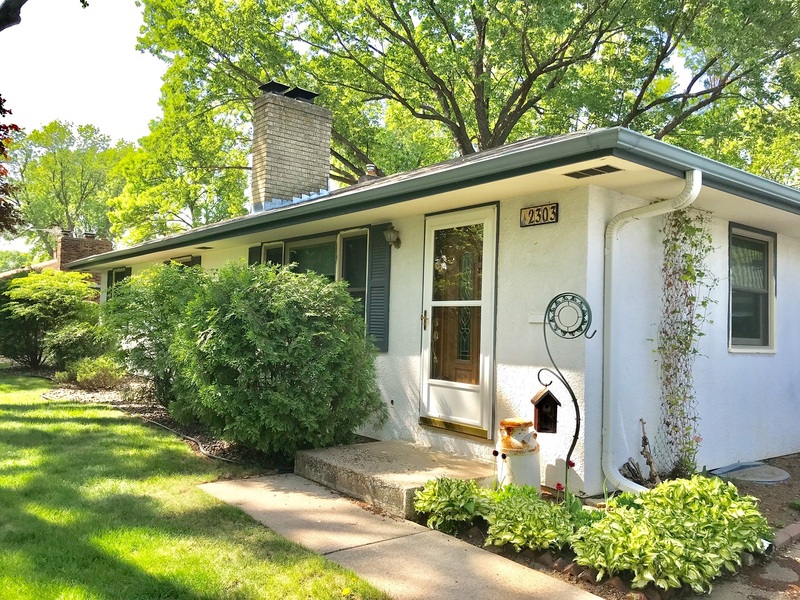 The stucco residence had been built in the late 1950’s and was in close proximity to several local shops and restaurants. While the couple had enjoyed living in their home, they had come to the conclusion that its curb appeal could be improved upon. 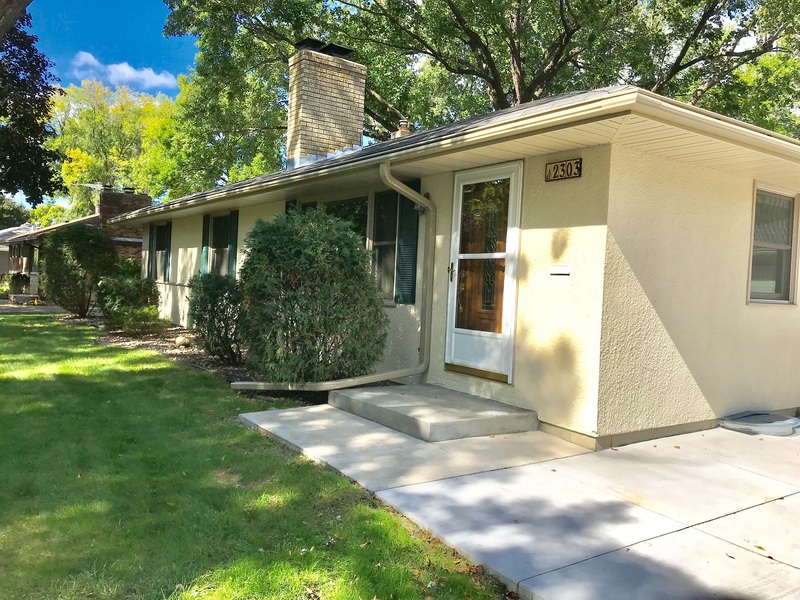 They planned to change their stucco siding from white to a warm beige. The beige was a more forgiving and modern color. To create a more maintenance-free exterior, they also decided to eliminate the landscaping around the side of the house in favor of a more useful concrete slab. In need of guidance, they opted for our expert opinion on gutters, soffit, and fascia. Gutter Problems: At our initial visit, we noticed a few concerning issues with the preexisting gutters. In many areas they were discolored and detracting from the home’s aesthetics. Their undersize design left the gutters susceptible to overflowing and clogging from organic debris from the stately trees that surrounded the home. These scenarios could lead to washed out landscaping, a wet basement and weathered stucco. Another spot that posed property damage were the downspouts. Installed in meager lengths, there was significant room for improvement to redirect water further away from the home’s foundation. Gutter Solutions: After understanding their options, Doug and Mary agreed that LeafGuard® gutter installation was the best course of action. Their industrial size ensured that the gutters would be able to keep up, no matter how significant the rainfall was. Because LeafGuard® is custom-built for each home it’s installed on, homeowners have the ability to choose from an array of contemporary hues. 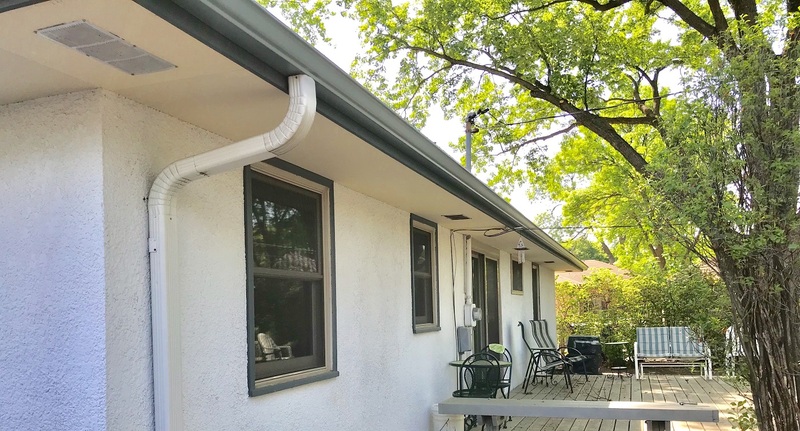 In order to better match the home’s exterior color, they opted to change their gutters from white to clay. Longer downspouts were installed to keep the home’s basement dry. Having recently had knee surgery, Doug was appreciative that LeafGuard® Gutters are accompanied with a no-clog warranty. Should they ever clog, the homeowner is not tasked with the cumbersome chore of addressing the issue. That’s because our team comes out for free and fixes the problem. Soffit & Fascia Problems & Solutions: Installed to match the home’s white stucco siding, the home’s soffit and fascia had become discolored. Wanting a more modern look that matched the soon to be beige stucco, they opted to have us wrap their fascia boards in beige aluminum. This would prevent the home’s fascia boards from ever rotting, which could cause the LeafGuard® gutters to pull away from the home. When we examined the home’s soffit vents, we found that they could be improved upon. TruVent® Soffit in Prairie Sand was installed which created a more desirable look that matched the rest of the exterior home improvements. TruVent® wins favor with the homeowners we work with because its proprietary design conceals vent holes, while still allowing an appropriate amount of air to flow through. Get an insider look at a Twin Cities kitchen remodel completed in a historic home. No More Gutter Maintenance For Bill in St. Paul! After resolving he’d cleaned his gutters for the last time, Bill began his quest to find the perfect ones to be installed on his home. "Really professional, easy to deal with." - Sharon D.
"The new LeafGuard® gutters look great. The crew did a fantastic job! Very professional." - Joe J. "They did a very professional job of construction on our gutters. They look great." - Catherine B. "Extremely happy with new gutters. Installation crew fantastic." - Warren S.
"Best investment I've ever made." - Jeannne N.
"We've had you install the gutters on the house, also installed attic insulation, and now the garage gutters. I'm looking forward to a much dryer garage next spring! The installers were a day earlier than expected and did a quick and excellent job. The sales rep, Brandon, was personable and informative." - Jeanne F.